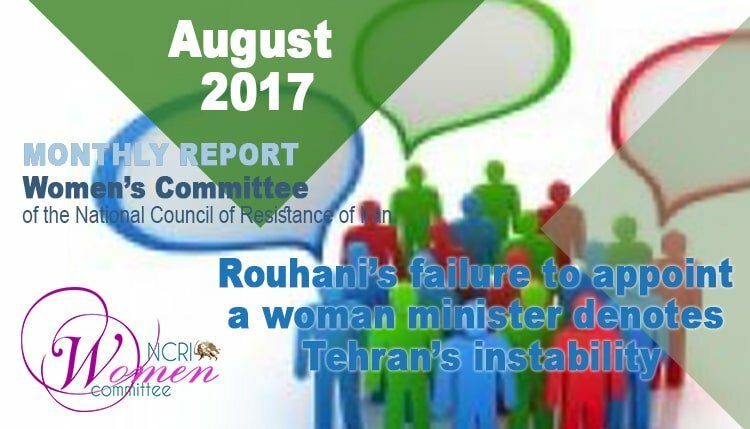 Rouhani’s new all-male cabinet was approved by the mullahs’ parliament or Majlis on August 20, 2017, providing further proof that not only he is not a moderate, but he is a demagogue and a charlatan who falsely promised to improve civil liberties including women’s rights, in his election campaign to win reelection. Rouhani had claimed that his administration “does not accept gender discrimination and injustice.” He also promised to appoint at least one woman to his Cabinet. But when the day came, it was announced that Rouhani’s staff had not been able to come up with a list of qualified women. The CNN reported: Iran’s newly re-elected President has not included any women in his proposed list of 17 ministers, according to Iranian state media, reneging on an election pledge to his largely reformist base… The exclusion of women from the proposed list was widely expected, though appointing a female minister was a central promise made by Rouhani during the election campaign. The Al-Monitor wrote: The Reformists expected Rouhani to appoint at least one woman as a minister — an expectation that has not been realized. Reuters wrote: Iranian president Hassan Rouhani appointed two women vice-presidents on Wednesday, but made no changes to an all-male list of cabinet ministers criticized by reformists for its lack of female representation. In any government, Vice-President is usually referred to someone who is the right-hand assistant to the President and enjoys the powers to act in his stead or replace him should the circumstances call for. Far from being Vice-Presidents, these women do not even have the powers to fulfill their own duties. A case in point was the situation of Shahindokht Molaverdi, who served as head of the presidential directorate for women and family affairs, during Rouhani’s first term. She had repeatedly admitted that she does not enjoy any executive powers to advance her directorate’s own projects. Whenever she attempted to take any superficial step in women’s favor that Rouhani’s government badly needed in its foreign relations, she had to back down under pressure. Molaverdi was eventually removed from her post and replaced by Massoumeh Ebtekar, the hostage-taker involved in the 1979 take-over of the American Embassy in Tehran who was herself removed from her position as head of the Environmental Protection Agency and replaced by a man. Molaverdi has been appointed advisor to the president on citizens’ rights, whatever that may be in a country that is the world’s top violator of human rights and holds the record of per capita executions, 3500 only during Rouhani’s first term which includes at least 80 women. The other woman appointed to a non-ministerial post is Laaya Jonaidi, presidential deputy for legal affairs. In order to take on the role, she was forced to wear the head-to-toe black robe called Chador, to be eligible to work in a government position. Since the mullahs’ religious dictatorship relies on misogyny as a pillar, Rouhani and his government need to defend and adhere to the same principles. Even if Rouhani had appointed several women to his Cabinet, it would not have solved women’s problems. To resolve women’s issues, they need to remove the numerous obstacles that presently exist and are built into Iran’s ultra-male-dominated political system. This is why the mere presence of one or a few women in the cabinet are not sufficient to eliminate discrimination against women and close the gender gap on economic and social fronts. Women face discrimination in numerous ways both in law and in practice under the fundamentalist regime ruling Iran. They confront unequal rights in marriage and divorce, discriminatory inheritance laws, lower levels of legal compensation and “blood money”, their testimony amounts to only half of a man in court, and they need to gain permission from their father, husband or brother in order to leave the country. They are marginalized in the economy and hired mainly in unofficial service sectors with wages far below the minimum wage and without any insurance. Their economic participation amounts to 13%, at maximum. So, Rouhani’s failure to appoint a single woman minister to his Cabinet denotes that the Iranian regime does not have the slightest capacity to tolerate even a symbolic gesture to recognize women’s right not to be excluded from a senior position on the basis of their gender. This means that the misogynous regime in Tehran cannot let loose on the suppression of women and back down from denying their equal human rights, lest it would lose its grips on power.